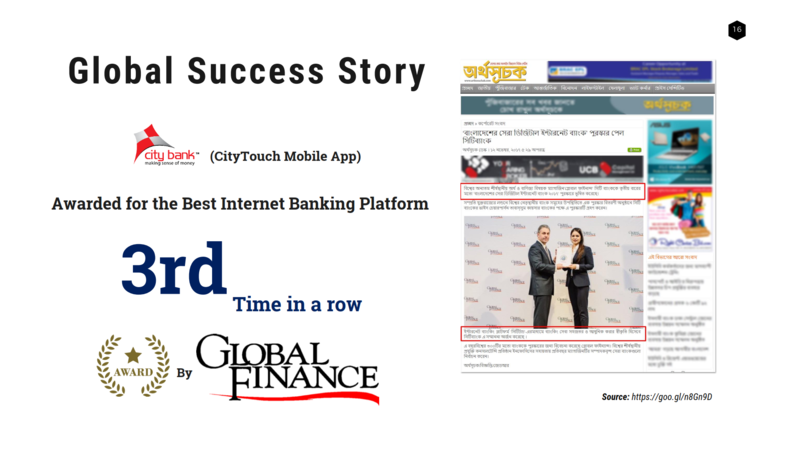 City Bank Bangladesh has launched their mobile phone app for serving their retail banking customers across the country. 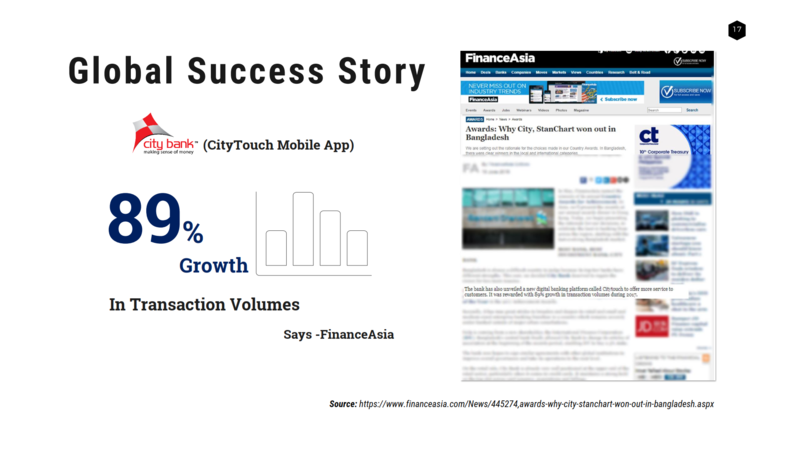 The local bank, which has pioneered modern banking in the country, introduced the app — ‘City Touch‘ through a launching event on their head office on October 2013. Then one of the top foreign banks in Bangladesh, Standard Chartered Bangladesh has also introduced the banking apps ‘SC Mobile Bangladesh’ and ‘Good Life’ -at an event at Westin Dhaka on May 2017. Real-time transaction of customers’ current, savings and fixed deposit accounts, maintenance of those in real time, fund transfer from respective Bank accounts to the accounts of any other bank in the country, payment of mobile phone and credit card bills online, purchase of airline ticket in domestic routes, payment of school fees, online shopping etc. The highly secured platform used by the internet banking apps developer companies to give the customers the comfort zone to use the apps without any fear of security penetration or any other security threats. Apps like City Touch also allows customers to find out real-time street directions for the branches and ATMs of the bank too. Also, provides full-scale information of all products and services of the Banks. Now let me tell you how internet banking with mobile apps helped banks to expand their services in the country. In our busy lives visiting bank is just another name of hassle that people often try to avoid these days. Therefore, the banks which are providing such facilities for which customers have to visit banks the less possible are actually the ones staying ahead in the game. On top of that, mobile-friendly online banking has been the most demanding service that banks had to adapt in the last few years. According to a statistics in recent times the online banking is taking place through mobile mostly. Approximately 80 percent of different Bank’s online banking is taking place through the mobile phones. The reason is very simple as the new age customers are more tech-savvy. So, probably 10 years down the line, many people will not come to the banks at all if the technology gets upgraded like this. Internet banking finds a fast rise, with over 41 percent growth recorded in the country in 2016. This is a quite healthy growth in real-time fund transfers, e-commerce, and online penetration and this growth have been possible for internet banking and banking apps that made customers life easier. A total of Tk 307.52 billion was transacted through internet banking in the past year, according to the March 2017 statistics obtained from the central bank. The figure is up from Tk 217.57 billion that was transacted in the previous year (2015). And this significant growth shows that there is a huge demand for good internet banking and mobile application among banking customers. Last January 2018 statics shows- currently, 40 out of 57 scheduled commercial banks in Bangladesh offer internet banking facilities. 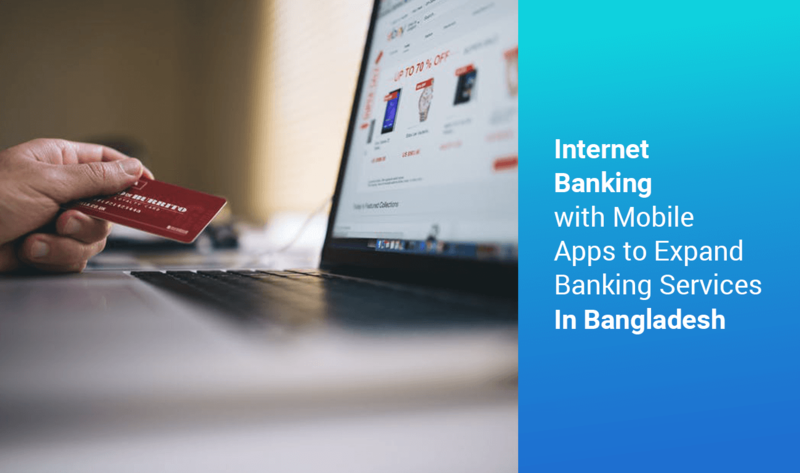 As of January 2018, there are nearly 17.61 lakh users of internet banking, according to data from the Bangladesh Bank. About 7.18 lakh transactions involving Tk 2,175 crore were made through the internet banking platform in January 2018. Internet Banking Fund Transfer (IBFT) transactions functionality is so far the most popular functionality in Internet Banking app. Thus it can be easily said that banking on a mobile platform will be the future competitive advantage for a bank to be triumphing in the market. iBanking saves the time and energy of the customers to deposit money or to transfer any balance as virtual banking ease the process of the physical presence of an account holder. Additionally, mobile banking gives people more security by generating a One-time password which avoids the possibilities of hacking ones account. Plus, given anything and everything is now happening through mobile phones, banks have got no other option left but to collaborate with telecom platforms. Which can open a new area of business for the telco companies as well. We are experiencing massive changes happening in the developed world and there’s no doubt on that, the air would flow through Bangladesh as well. In countries such as Japan and South Korea, people are not using plastic cards anymore rather using their mobile phones to transfer money and to buy products. So, it’s just some matter of time when we will see such drastic changes in our country. According to Bangladesh Bank, the number of transactions through internet banking has got posted a healthy 21.34 percent growth from 2015 to 2016. Which shows around 6.39 million banking transactions took place online in 2015 while the number rose to around 7.75 million in 2016. The average value of internet transaction also rose from Tk 34036.51 in 2015 to Tk 39661.44 in 2016. Then, according to BTRC, country's telecom regulator, there were around 67 million internet subscribers in the country at the end of October 2016 among these 94 percent people were connected online through the mobile internet like 3G or GPRS. All these information indicates that it’s very important for the banks to offer the convenient and banking services for this generation tech-savvy customers. Direct banks are open for business anywhere where there exists internet connectivity. Other than times when website maintenance is being done and they are open for 24/7, 365 days a year. If internet service is not available, customer service is normally provided around the clock via telephone. Real-time account balances and information are available within few touches. This makes banking faster, easier, more efficient and even more effective because consumers are able to always stay on top of their account balances. The lack of significant infrastructure and overhead costs allow direct banks to pay higher interest rates on savings and charge lower loan rates. Some accounts can be opened with no minimum deposits and carry no minimum balance or service fees. Direct banks typically have more robust websites that offer a comprehensive set of features that may not be found on the websites of traditional banks. These include functional budgeting and forecasting tools, financial planning capabilities, investment analysis tools, loan calculators and equity trading platforms. They also offer free online bill paying, online tax forms and tax preparation. Online banking now includes mobile capabilities. New applications are continually being created to expand and improve this capability on smartphones and other mobile devices. Accounts can be automatically funded from a traditional bank account via electronic transfer. Many direct banks offer unlimited transfers at no cost, including those destined for outside financial institutions. They will also accept direct deposits and withdrawals that you authorize, such as payroll deposits and automatic bill payment. Online accounts are easy to set up and require no more information than a traditional bank account. Many offer the option of inputting your data online or downloading the forms and mailing them in. If you run into a problem, you have the option of calling or emailing the bank directly. One advantage of using online checks is that the payee’s information is retained, which eliminates having to re-enter information on subsequent checks to the same payee. Internet banking is also environmentally friendly we can say. As electronic transmissions require no paper, reduce vehicle traffic and are virtually pollution-free. They also eliminate the need for buildings and office equipment for Banks. Then with a banking app, the convenience is even more to the banking customers. We can see the demand for City Touch app in the market as we have provided the service and can see the increasing service demand for the app. So, I would conclude saying that internet banking with mobile apps are a must for the banks unless any bank wants to be extinct like a dinosaur.